Update: (3/22/08) - I have received over 30 e-mails from all over the world thanking me for this fix. It feels great to be able to help everybody with this problem. 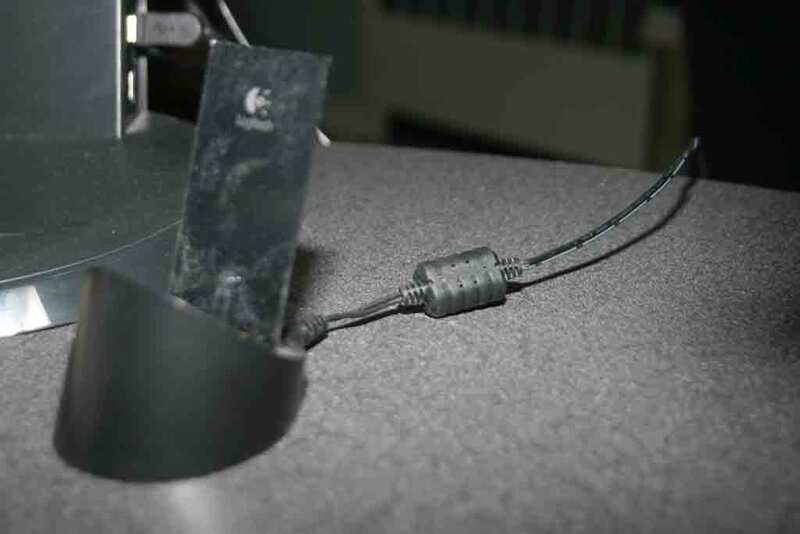 I've also received a couple e-mails informing me that there is a new revision out by Logitech, which puts what looks like a ferrite core in the power line. Take a look (Thanks to Jimmy). From what I hear, the older mice still have issues charging on these new stands, so it hasn’t made too much of a difference. Update: (12/25/07) - I have also heard that cleaning the contacts can fix this problem, as mentioned by the comment in this youtube video. It is always a good idea to try the simple solutions before resorting to more drastic ones! Update: (12/5/07) - I have heard that a long extension cord (~100ft) may work as a temporary fix. 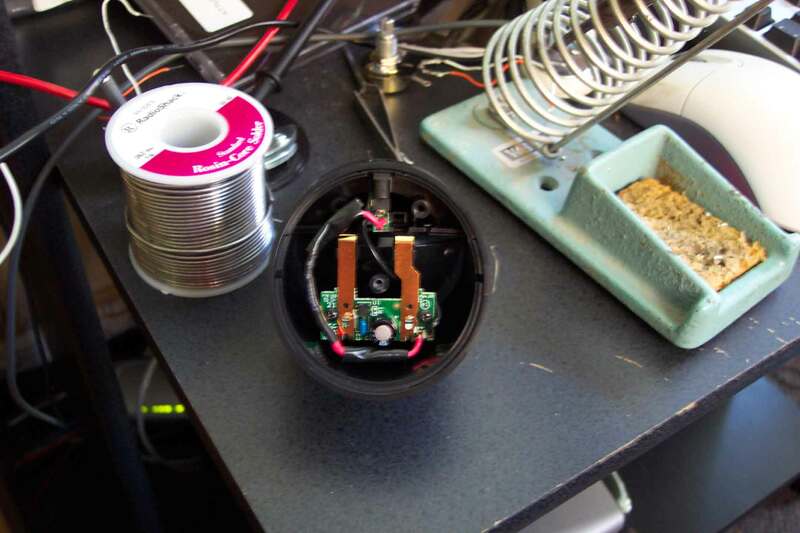 This raises the resistance, thus lowering the voltage to the charging stand (Same idea as my solution below). I have not tried it myself, but it may be worth a shot for somebody else. Update: (7/16/07) - It has been more then half a year since I have created and applied this fix, and my mouse still works perfectly! Thank you for all the e-mails! If you have a question or comment, feel free to contact me. Also, for anybody with this problem, contact logitech first. They will be more then happy to replace your "faulty" mouse with a working one. 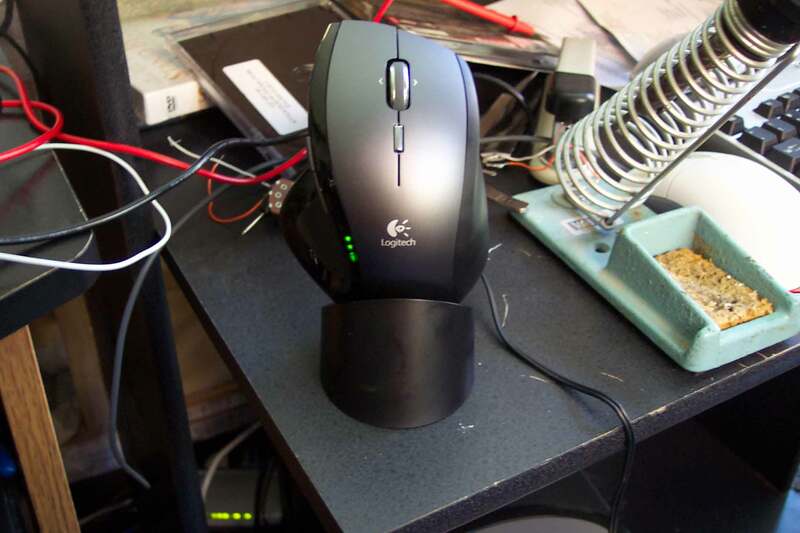 I've heard of people getting sent new mice and told just to throw the old one out - in which case there is nothing to loose by attempting to fix it. Please note that the content on this page has no affiliation or connection to Logitech, or it's affiliates, and I am not responcible for any damages done using this method... do at your own risk (or just read along out of couriosity :) -- Maybe logitech could use the information here to fix the problem so they dont have to sell products that don't always work. These two paragraphs describe the testing that I went about to figure out how to fix the charging problem. At first, I looked at the stickers on the power cable, dock, and the mouse. The power cable and the dock are rated at 8V, 500mA... I tested the cable/dock finding they're outputting 8.5V, close enough for the electronics at hand. I tested the short circuit current of the dock/cable, measuring only 250mA. I was wondering if the mouse would charge better on a higher current source. 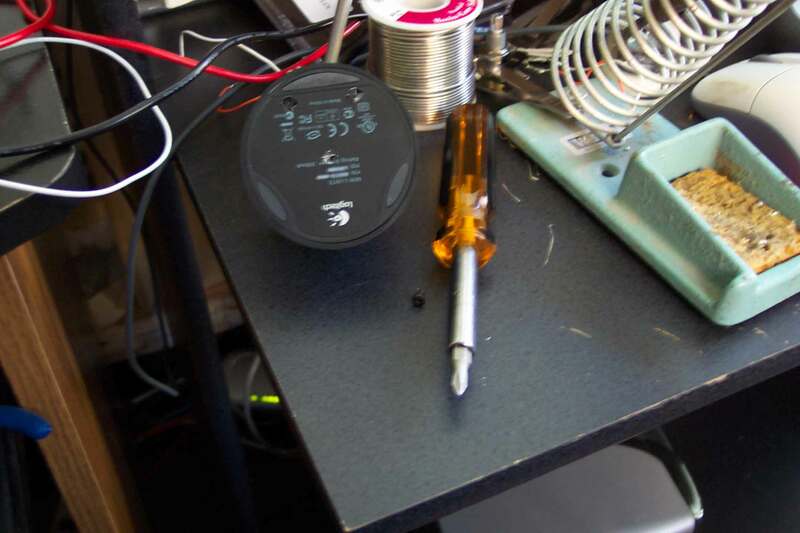 I used a 9v battery (measured at about 8.2V and capable of 1.5A) and variable resistors in parallel (to limit the current to around 500mA). 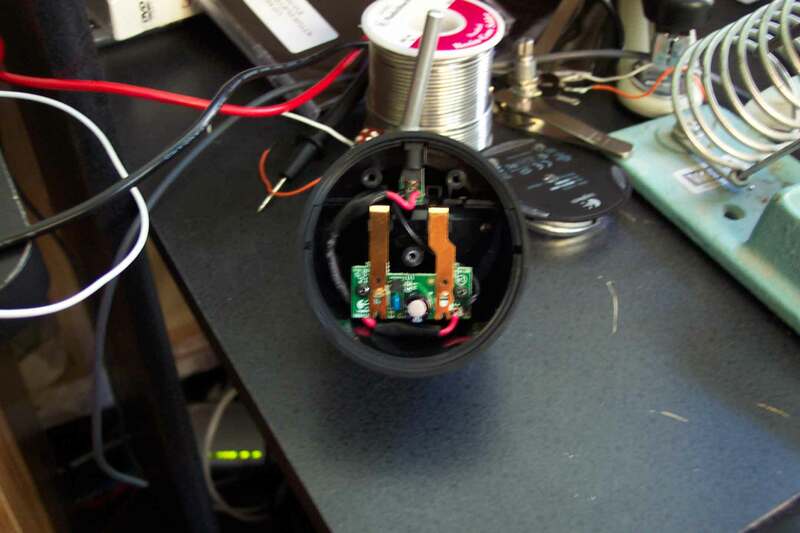 I was measuring the current to the mouse, and the internal resistance of the mouse would not let the current surpass about 70mA, so current wasnít the problem. Something that clicked at this point was that the mouse was rated at 4.1V, 800mA, and the chargers where twice that much, so I put the variable resistors in series creating a voltage limiter. When I first connected the mouse, it was only receiving about 3.2V, but it was charging properly! (No errors) This made me happy, but I knew that it wouldnít charge very fast at that voltage, so I slowly raised the voltage. 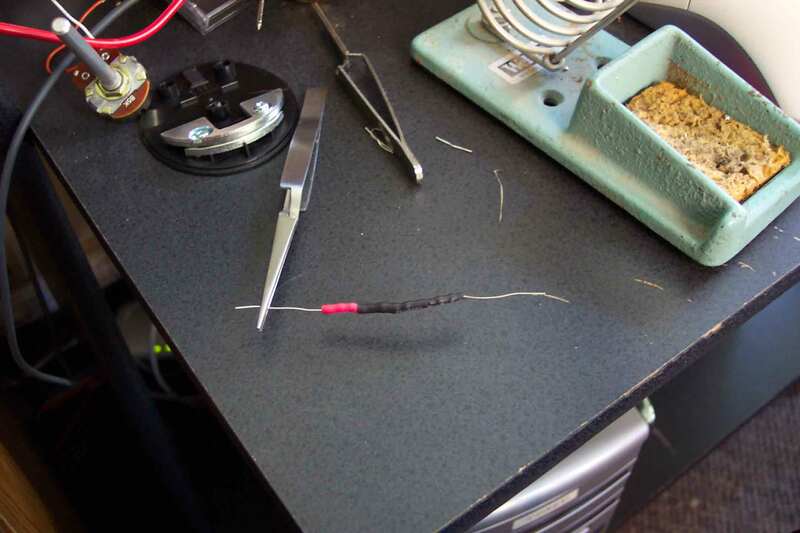 The mouse would charge without errors until the resistors started getting down around 25 Ohms (lower resistance = higher voltage on the mouse). 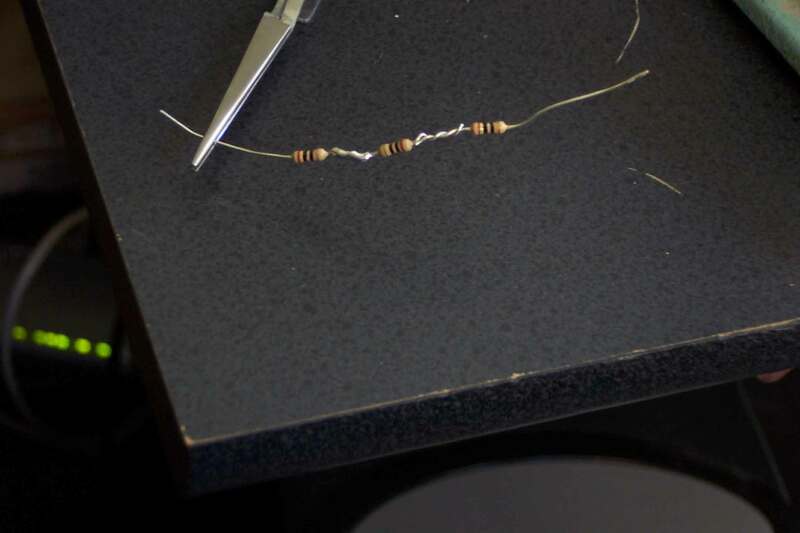 I then swapped out the variable resistors with set resistors to prepare to make it permanent. I experimented around with different values and found that 30 Ohms was the lowest I could go and still get a stable charge. At this point I was ready to put them in a more permanent setup, as described below. 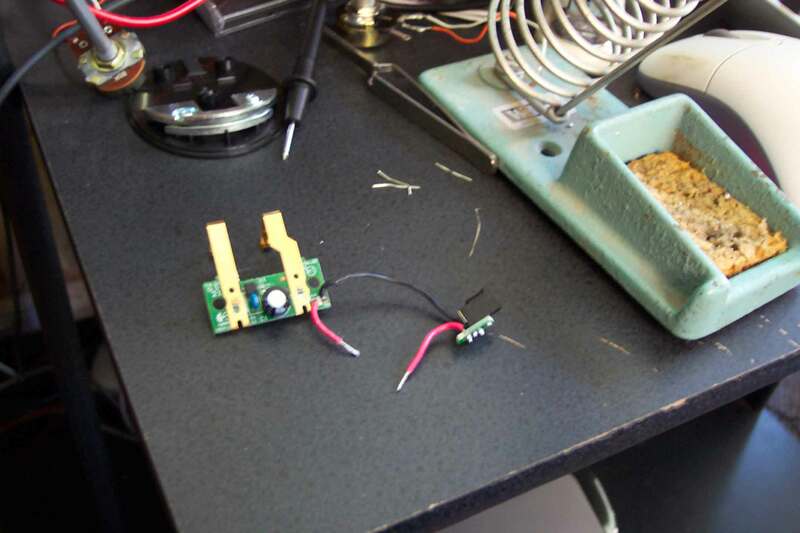 In Theory this setup: will drop voltage across both the resistors and the mouse/battery. At the beginning of the charge, both will get about 4.25V (half of the source each). As the battery in the mouse charges, its internal resistance raises. 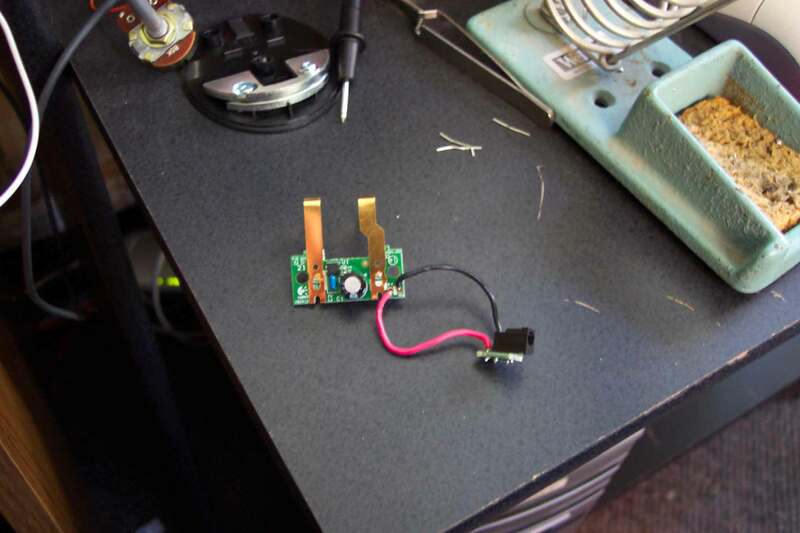 Thus, the voltage applied to the mouse will raise, dropping the voltage on the resistors. By the time the mouse is fully charged it will be getting all 8.5V that the charger is supplying, basically back to the way it was as if there were no resistors. I'm no expert, just a freshman in college (Computer Engineering), so if anybody wants to correct me, feel free to contact me. The bottom of the cradle. There's three screws, just phillips head, nothing special. They're placed under the X's in the sticker. The inside. 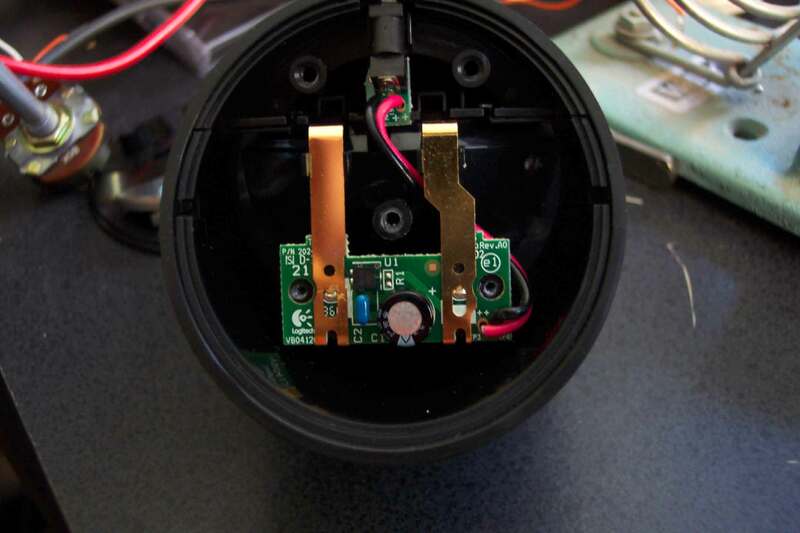 You can see the charging circuit is nothing special... a couple of capacitors, and a transistor (or looks like one). there is a place for a resistor (R1), mabye that's what's causing the problem? 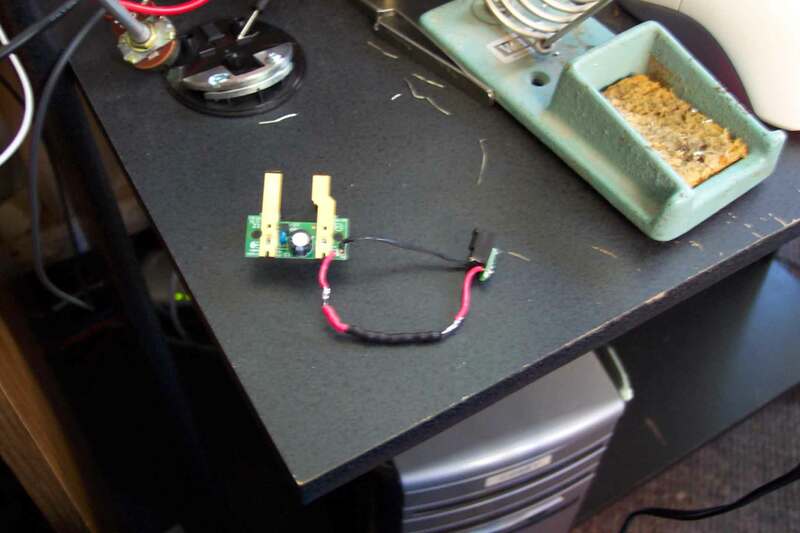 This is where I made the splice in the circuit to put the resistors. The metal weight on the bottom plate was blocked by the wire/resistors, so I tucked the resistors underneath the circuit. This project took me about 3 hours, with testing, and writing most of this page. If I only did the soldering and placement (what's pictured here), it probably would not take more then a half an hour. I put my mouse on the cradle while I was out for the day and it was fully charged when I got back. The Logitech software on my computer says it has 18 days left for the charge (90%). This is much better then the overnight I did without the repair, and it only being 3 days (20%)... I've been using the mouse for the past few hours, with no negative effects... I will keep you updated! Day 1: It's Midnight, and the mouse is still working perfectly... the software has dropped a few days off the battery(now at 15 days / 80%) I don't plan on charging it tonight, so it should give a rough rating on how well it charged. Day 2: I've been using the mouse all day, the charge has dropped quite a bit (8 days / 45%) but it dropped there early this morning and hasn't moved since. Day 3: Today I moved back into my dorm room... I just barely set my computer up, powered on the mouse, and the charge level raised! (11 days / 60%) The readings was a little erratic today, but I think that's just because I checked it every 10 minutes. Day 5: My mouse has been on for about 7 hours today, used often. Today it started out a little low (3 days / 25%)... and is still at that level. Day 8: Tonight's gaming night! I brought my mouse down to the party, played for 6 hours straight with the batteries at 'critical'. No problems! Day 9: The batteries are still at 'critical', and I didn't feel like letting my mouse die on me during a game, so I charged it for no more then twenty minutes and the batteries were back up to about 5 days and lasted me the rest of the day (could have longer). Finally, I charged it overnight. (10/31/06): It's been Over a week, and it still works perfectly. I've charged it once more since Day 10, and it probably didn't need it. Overall, I'm happy with the mouse, but it would have been nice if I didn't have to mod a brand new item to make it work. (8/28/07): Now, it's been almost a year since I created and implated this fix, and... My mouse is still working just as well as above! Not a single problem.